Dearborn, Mich. (Nov. 16, 2017) – During the invasion of Iraq by a U.S.-led coalition in 2003, the College of Fine Arts at the University of Baghdad lost its entire library to looters who set fire to the collection. More than 70,000 books were reduced to ashes. Nearly 15 years later, students at the college still have few books from which to study. In the installation 168:01, acclaimed artist Wafaa Bilal has constructed an austere library containing only blank white books. The white library serves as both a monument to the staggering cultural losses endured throughout Iraq’s history as well as a platform for its rebirth. Aimed at restoring the college’s lost archives, 168:01 positions viewers as potential participants whose contributions fund educational texts from a wish list compiled by students and faculty. 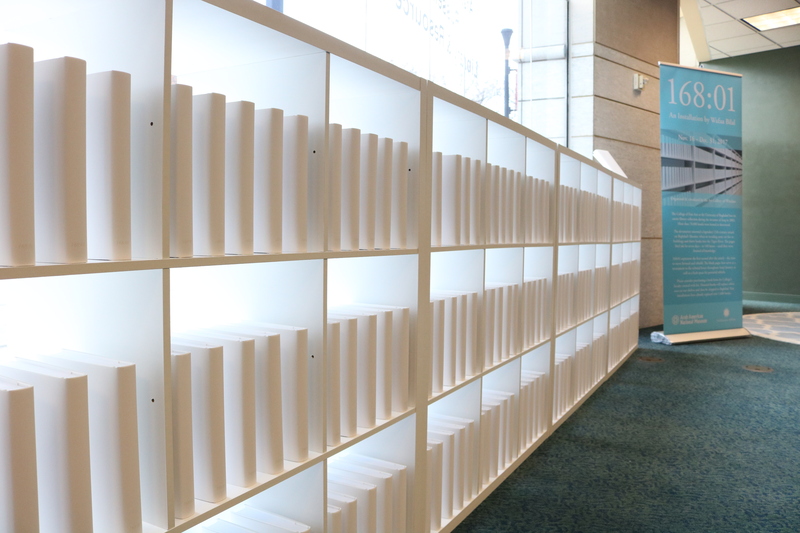 As the installation accrues donations, the blank books are replaced with new ones and the library’s shelves become saturated with knowledge and vibrancy. Select donors receive these books in return for their contribution and as a symbol of the void they have helped to rectify. At the end of the exhibition, all donated texts will be shipped to Baghdad. In this way, the white library activates a system of exchange connecting its visitors in the United States and beyond to the College of Fine Arts in Iraq. 168:01 will be on display Nov. 17-Dec. 31, 2017, in the Russell J. Ebeid Library & Resource Center at the Arab American National Museum, 13624 Michigan Ave. in Dearborn. It’s free and open to the public during regular Museum hours; donations to the project are encouraged. 168:01 was conceptualized and produced for Bilal’s major solo exhibition at the Art Gallery of Windsor (Ontario, Canada) in 2016. AANM’s presentation of 168:01 runs concurrently with its presentation as part of Negotiating the Future: 2017 Asian Art Biennial, Sept. 30, 2017–Feb. 25, 2018, at the National Taiwan Museum of Fine Arts. Bilal is among 30 artists in that group show curated by Kenji Kubota (Japan), Ade Darmawan (Indonesia), Wassan Al-Khudhairi (Iraq) and Hsiao-Yu Lin (Taiwan). Iraq has a long history of cultural destruction. During the Islamic Golden Age in the 13th century, an invading Mongol army set fire to all the libraries of Baghdad, including the famed House of Wisdom, or Bayt al-Hikma. Legend describes the invaders throwing the Bayt al-Hikma’s library into the Tigris River, creating a bridge of books for their army to cross. The pages bled ink into the river for seven days (or 168 hours), at the end of which the books were drained of knowledge. For Bilal, 168:01 refers to the first moment when grief is transformed into a call to action, signaling the struggle to move forward from the ashes of ruin. A successful crowdfunding campaign started in 2015 has earned 168:01 Kickstarter Gold status. The project has been expanded from its original form in 2015 to include a complete renovation of the library space using locally sourced materials and labor. Volunteer architect Wei Cai has developed a design that will house the donated books and provide communal reading space for students and faculty. At the end of this exhibition, all donated books from the exchange will be shipped to the College of Fine Arts at the University of Baghdad. Iraqi-born artist Wafaa Bilal, an associate arts professor at New York University’s Tisch School of the Arts, is known internationally for his online performative and interactive works provoking dialogue about international politics and internal dynamics. For his 2007 installation, Domestic Tension, Bilal spent a month in a Chicago gallery with a paintball gun that people could shoot at him over the Internet. The Chicago Tribune called it “one of the sharpest works of political art to be seen in a long time” and named him 2008 Artist of the Year. Bilal’s work is constantly informed by the experience of fleeing his homeland and existing simultaneously in two worlds – his home in the “comfort zone” of the U.S. and his consciousness of the “conflict zone” in Iraq. Using his own body as a medium, Bilal continued to challenge our comfort zone with projects like 3rdi and …and Counting. Bilal’s most recent body of work, Canto III, premiered in a solo booth at the New York Armory Show in 2015 and went on to be shown in the 2015 Venice Biennale. In 2008, City Lights published Shoot an Iraqi: Art, Life and Resistance Under the Gun, about Bilal’s life and the Domestic Tension project. He holds a BFA from the University of New Mexico and an MFA from the School of the Art Institute of Chicago. His work can be found in the permanent collections of the Los Angeles County Museum of Art, Los Angeles, CA; Museum of Contemporary Photography, Chicago, IL; and MATHAF: Arab Museum of Modern Art, Doha, Qatar; among others. Learn more at http://wafaabilal.com/.